As we grow older, we realize that the most important things to us are not items that can be bought; rather it is the people that can not be replaced. Disaster can strike anywhere at anytime. It is important to take the steps to create a family plan so that everyone in your family will know what to do in an emergency or disaster situation. These steps include: Making a Plan, Creating an Emergency Disaster Supply Kit, and Staying Informed. Taking the time to do this now, will help you stay calm and think clearly in an emergency situation. You should include how to contact each other in the event of an emergency. Consider a plan where each family member calls, or e-mails, the same friend or relative in the event of an emergency. This will be especially handy if you are separated from your family at the time that disaster strikes. Remember everyone will be trying to make phone calls to find their loved ones and make sure everyone is okay. It may be easier to make a long-distance call rather than a call across town-so pick an out-of-town contact person. This person can relay information between your family members to help you all meet up. Make sure everyone knows the phone number to call and that they have the means to make the phone call. Watch the television, monitor the radio, and check the internet to keep updated on the incident at hand. This will help you decide if you need to shelter in place or if you need to leave for a safer area. Plan how you will assemble your family and anticipate where you will go. Make sure you have several different destinations available for you to choose from. If you have a car, keep your gas tank at least half full at all times to ensure you will have enough fuel to get you to your destination. Know several different routes that you can take to get to your destination and have other modes of transportation available to you. Take your emergency supply kit (unless you have reason to believe it has been contaminated) and lock your door behind you. Don't forget your pets. Make sure they are allowed at your destinations. If they are not allowed, make alternate arrangements for their care. Finally make sure you know the emergency plans at your place of work or school. Find out how they will communicate with you during an emergency. For more information on making a plan click the button below. Consider having two Emergency Disaster Supply Kits--One for at home and One for your car. - activities to keep children entertained, etc. For a more detailed list of what can be included in your Emergency Disaster Supply Kit click on the button below. Stay alert to what can happen. Know the types of emergencies that can occur in your area such as: tornadoes, flooding, extreme heat, winter storms, earthquakes, wild fires, and chemical releases. Be alert to changing weather conditions. 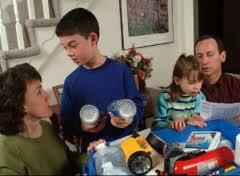 If you do not have one purchase a NOAA weather radio to help keep you informed of severe weather in your area. This is your "smoke alarm" to severe weather. Any warnings that the National Weather Service put out will be transmitted to you through your device if you are in the affected area. Keep extra batteries on hand so that your radio can still operate in the event of a power outage. Know the difference between warnings, watches, and advisories. This will help you determine when to seek shelter.